Like Townsville, the McElrea Racing (MR) crew always look forward to the Bathurst round. Apart from the awesome challenge for our drivers we have had great success in the past with Michael Patrizi winning the round in 2011 and Alex Davison and Tony Bates doing very well last year. 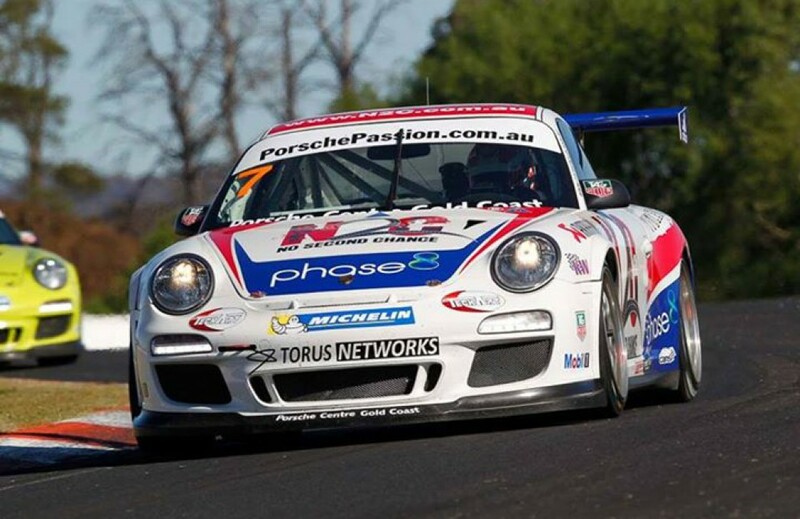 It was the first round win for Luffy in Carrera Cup and the second round on the trot for MR (Patrizi at Winton). The awesome MR crew put in the hard yards and as a result Luffy’s N2C car was a rocket all weekend at Mt Panorama. After qualifying second behind Percat, Luffy did a solid job to finish where he started. In race two Luffy had a demon start from the outside of the front row and ran around the outside of Percat at turn one and drove an amazing race to head home Baird and Percat. Race three saw Baird get a typically good start and just headed Luffy into turn one. While it was an exciting race, Luffy was well aware that another second place finish would give him the round win, so he drove accordingly to secure the result he needed. ‘Stiggy’ had a weekend that didn’t match his expectations. With Michael’s blessing MR tried some unconventional set ups on his car in an efffort to find extra pace. While they didn’t yeild the result he wanted on the mountain, Michael is confident they will work really well at our final round of the season at Surfers Paradise. He was unfortunate to suffer some minor panel damage in a stoush with Percat at the start of race three. As a rookie to Bathurst, ‘Wallsy’ came to the mountain with a clear intention of finishing every lap possible over the weekend. He had a good weekend and enjoyed his first visit to Mt Panorama. He is looking forward to going back next year in the awesome new 991 Cup Car. Bathurst was a shocker for Batesy – after qualifying well, in race one he got out of the groove across the top of the mountain and hit the outside wall. The MR crew did their best to repair the AFS machine but unfortunately a shortage of some key parts forced Batesy into retirement for the weekend. The team has a quick turnaround before the final round at Surfers Paradise and we are looking forward to another strong performance.